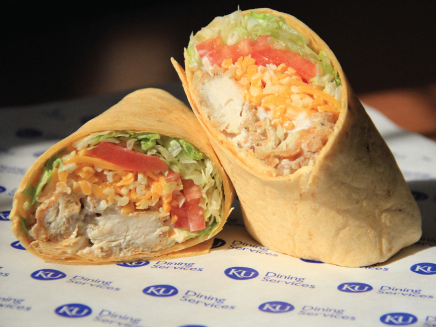 This wrap really caught on with students because it includes all their favorites: chicken strips, ranch dressing and cheese. Lay out tortilla on work surface. Mound lettuce across middle, leaving a 2-inch border on each side. Arrange tomato, cheese and chicken over lettuce. Drizzle with ranch dressing. Tuck in one-fifth of tortilla on both sides. Firmly gather top of tortilla and fold towards center. Continue to roll, increasing pressure to ensure a tight roll. To serve, cut wrap in half and wrap in deli paper.